Free float tube to free float the barrel for increased accuracy and better barrel cooling. Light knurl finish for positive grip even with gloves. Ladder Panels offer very low-profile 1913 Picatinny rail coverage. The Santoprene material provide a rubbery surface for improved weapon control and rail protection. Three (3) panels per package. Manufactured by Egro Industries, Inc. The Hornady full profile rail covers are molded from rigid polymer and secure to the rail with a locking tab. 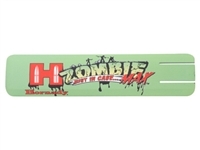 The rail cover features the "Zombie Max" red and white logo on a bright green background. This rail cover is perfect for sporting on your rifle or shotgun running Z-Max ammo for the next "undead" match! Stylish picatinny rail covers featuring "Fueled by Hornady". Sold as a set (2 covers) and also includes 2 "Fueled by Hornady" stickers. 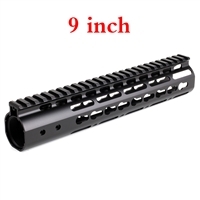 Universal keymod rail system allows for modular attachment of picatinny rifle accessories such as bipods, grips, lights, or sights.